Lily is the name given in Sonic X for the blue Flicky that Amy Rose befriends in Sonic Adventure, although the creature was referred to only as "Birdie" in the game. During the game's story, she is being chased by Doctor Robotnik for the cyan Chaos Emerald hanging around her neck. Before the beginning of Sonic Adventure, Lily and her family were apparently captured by Dr. Robotnik, to be used as organic batteries in his badniks. Amy first encounters Lily in Sonic Adventure when the bird slams into her after escaping from Robotnik's Egg Carrier. Soon Lily is pursued by ZERO and Amy vows to protect her. 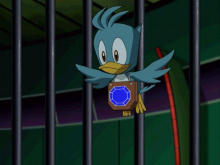 After getting separated from Sonic, Amy and Lily get kidnapped by ZERO and are put in a holding cell aboard the Egg Carrier. Robotnik orders E-102 Gamma down to the cells to retrieve Lily from Amy, and as the robot approaches, Lily flies up to Gamma's face, appearing to almost recognize it. Unknown to Amy, a member of Lily's family was inside Gamma. Because of this, Gamma reneges against his programming and releases the two. After Amy and Lily escape from the Egg Carrier, Amy discovers the picture of Lily with her family in the locket around the bird's neck. Amy decides to help Lily find her family. They eventually come back to the Egg Carrier where they do find Lily's family, recently released from their E-series hosts E-101 Beta and E-102 Gamma when the robots destroyed each other. Just as they were about to reunite, Lily is shot down by ZERO. Angered, Amy fights and destroys it. Lily is not seriously hurt by ZERO's sneak attack and is able to fly off with her family. During the course of Sonic Adventure, Lily always appears flying by Amy's side. But she will not appear while in the Chao Garden or in Sonic Adventure: DX's Mission Mode. Lily's gender was changed to male in the English version of Sonic Adventure for unknown reasons. While the Japanese version also makes it clear that Lily and the other two flickies are siblings, this is never mentioned in the English version - only referring to the other two birds as "family". In Sonic X, Lily's keeps her role from the game, as well as her original gender. This page was last edited on 18 February 2018, at 04:25.